While our more extensive billing features are still only available on the website, you can use the app to send invoices, receive payments, or add credits to family accounts. To use Billing, click on the icon in the app's bottom tray. Only administrators on the Kinderlime account will be able to access billing information and make any changes to family accounts. 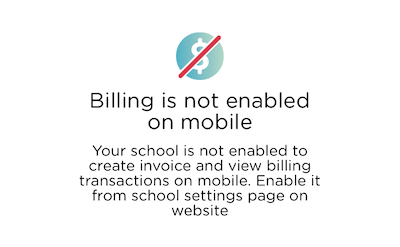 If you see the screen above and you are an administrator, you will need to turn on Billing under School Settings on the Kinderlime website.